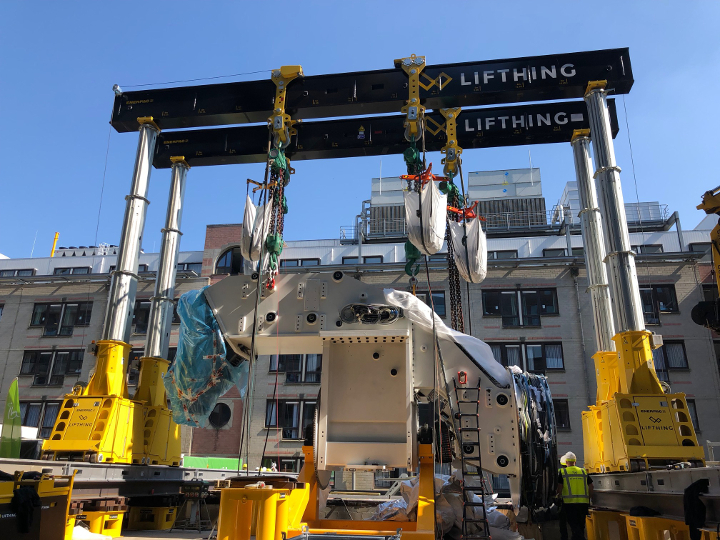 Industrial installation company, Lifthing NV, has completed installation of proton therapy units at the University Hospitals Leuven (UZ Leuven), Belgium’s first proton therapy center. 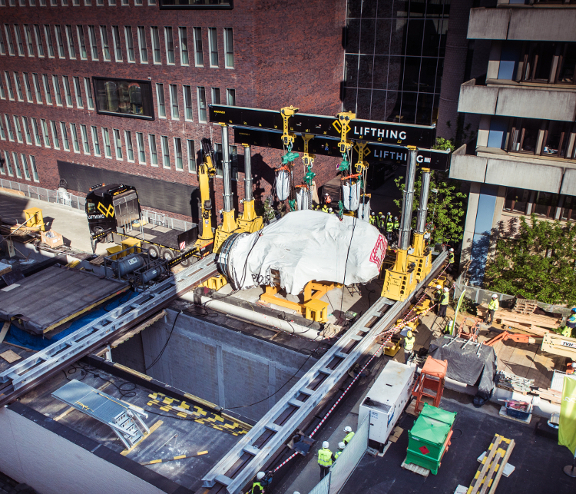 An Enerpac SBL500 gantry was used to lower two 57-ton synchrocyclotrons and a 75-ton therapy unit into the hospital’s Particle Therapy Interuniversity Center (ParTICLe), a clinical and scientific collaboration between five university hospitals and their network hospitals. The new proton therapy centre at UZ Leuven’s Gasthuisberg campus features an IBA ProteusONE system from IBA (Ion Beam Applications S.A.), a Belgian company and worldwide technology leader in the field of proton therapy. The centre consists of two underground bunkers: one for clinical treatment of patients and one for high-technological research. Each bunker is equipped with its own particle accelerator or cyclotron. The proton therapy center is scheduled to begin treating patients in the second half of 2019. Given the space restrictions at the Gasthuisberg campus, Lifthing opted to use its Enerpac SBL500 gantry. Enerpac hydraulic telescopic gantries are a safe and efficient way to lift and position heavy loads where space limitations prevent the use of mobile cranes. The two 57 tonne synchrocyclotrons and larger 75 tonne therapy unit were successfully skidded along the gantry’s skid tracks and lowered into the research bunker and clinical treatment bunker respectively. The Enerpac heavy-duty SBL-Series Super Boom Lift gantry is manufactured by Enerpac Heavy Lifting Technology at Hengelo in The Netherlands. With capacities up to 10.484 kN and 3-stage lifting capability, the SBL-Series provides synchronised lifting and lowering for heavy lift projects. For more information on Enerpac hydraulic gantries, visit www.enerpac.com. For more information on Lifthing NV visit www.lifthing.be.